* With a fun-filled sunny summer just around the corner, it’s time to unleash your wild looks! 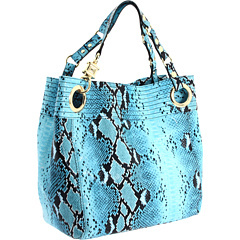 * This sassy tote is made of coated Snake-embossed polyester for easy care. * Spaciously holds your wallet, sunglasses, personal technology, bottle of water and a few cosmetics. * Over-sized grommet accents with studded detailing on the shoulder straps. * Magnetic snap closure with a side interior snap-tab closure. * Print-lined interior features a back wall zip pocket and elasticized slip pockets. Steven is evolving into a lifestyle brand. Steven shoes offer an abundance of styles and silhouettes for every type of woman. Whether you prefer a casual shoe or a dress shoe, Steven has designed and crafted the perfect shoe for you. Steven shoes also offer many different heel heights to suit any woman’s needs. From ankle boots and knee-high boots to peep toe wedges and slides, Steven has all the bases covered.